There is a lot of research that suggests riding a bike is very good exercise. It is also a nice way to enjoy the countryside, especially if you use a mountain bike to go along the trails. You might not always want to peddle however, so this is where it can be useful to have an electric mountain bike. They have all the advantages of an electric bike and a mountain bike rolled into one. This list features the top three electric mountain bikes on the market today. The West Hill Pro Terrain (Learn More Here!) is a well-made mountain bike that combines pedal and assisted drive in a way that doesn’t make it too bulky. Here are some of the other features of this bike. The 36 volt 10ah Li-ion battery enables you to get a lot of power over a long time span. It also gives you high speed, up to 25mph. There are three levels of pedal assist with this bike. You have low, Medium or High depending on your need. It is easily controlled using the button on the handle bars. This bike is fitted with a Shimano TX55 Gear System. This makes changing gears very easy, and is more precise than other gear types. You have two fitted lights at the front and back to give you great visibility in the evenings. This is especially useful if you are cycling on a remote road with no lights. With so many features, this bike from West Hill has everything you need to have a great ride in the country. This is made even more comfortable with the Omega Suspension fitted to the front forks. This electric bike made by Cyclamatic is a tough and durable machine that will give you the pedal assistance when you need it. It has a more traditional style, but it is packed with great features. Let us take a look at some of them. There are large 17 inch mountain bike tyres that are ideal for people of any height between 5 feet 5 inches and 6 feet 2 inches. The larger wheels also offer better handling. The lithium-ion battery weighs less than the conventional lead-acid types and also offers more power. On average, you will get a 45km range from each charge. This bike is fitted with a Shimano tourney SIS index gear system. This gives you a quick change capability as well as precise gear selection. Ideal when you need to change gears quickly. With a quick release front wheel and battery, this bike is easy to take apart for storage and transportation. Great for commuting or travelling. 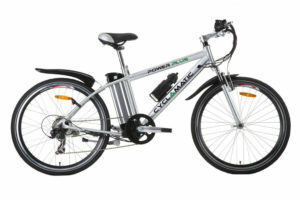 The Cyclamatic Power Plus Electric eBike is a stylish and durable example of what you can get with this type of amalgamation. It has all the advantages of a mountain bike, as well as the assisted pedal if needed. 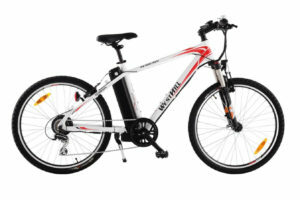 The next on the list, is the Viking Advance Electric Mountain Bike. 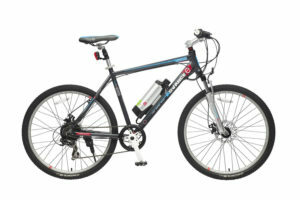 It is classic mountain bike design with a very clever placement of the battery to evenly distribute the weight. Let us see some of its features. It is fitted with dual disc brakes at the front and rear. This is considered more effective at breaking than traditional brakes. You can easily travel up to 20 miles on one charge of the battery. This is dependent on how much you use the assisted pedals. With only a 3 to 4 hour charge time, you can be up and running again in no time. Great if you need the bike every day. Weighing in at just 23kg, this bike is very light for an electric cycle. This means that transporting it will be no problem. Overall, the Viking Advance Electric Mountain Bike will be a great addition to the exercise regime, or a very handy tool for the daily commute. The top spot on the list goes to the West Hill Pro Terrain. It is packed with many nice features and is also well made. The three levels of assistance and precise gear system, all make this bike a worthy winner.